Before we went on vacation I was on a 28 day workout streak. 28 DAYS! I’m taking vacation as a good excuse to break that streak and I have worked out a couple of times since we’ve been here, along with the insane amount of walking that you do just by being at Disney World and keeping up with two crazy little boys! I’ll be excited to get back to a consistent workout routine as soon as we get home because during that almost month-long workout streak, I felt amazing. I felt myself get stronger, fit better in my clothes and I was just, overall, happier and more energetic. When I start my new streak, I’ll be doing it with intention, but the pre-vacation streak just kind of happened. I felt motivated and excited to do it as I got further and further into it. So, I thought I’d share how I’ve been keeping up my motivation to workout, how I make time for it and why that works for me! I sometimes think about why I workout and, naturally, a sizable part of that is to look good and feel good in my clothes, and for more appearance-related reasons. But another huge part of my “why” is that I do it to have the energy and strength to keep up with my kids. They’re busy and so I really want to be in a place health-wise where I can chase and play and do whatever – basically keep up and then some! I also think it’s a good example for the boys to see their mom be healthy and active. Jackson has been super sweet with making me signs for every big milestone ride that I’ve done. And when I’m riding and he’s next door in the playroom, he’ll come out and check on me to see how I’m doing and if I’m working hard. So on the days where I want to skip and hang out on the couch or days where I’m just down and unmotivated, I think of my “why” and it helps me get moving and at least do something. Because a 20 minute walk or ride is better than nothing! Obviously nothing is going to keep you more motivated than to see what you’re doing actually working. For the longest time I was hung up on why the number on the scale didn’t say what I wanted it to. And while that was bothering me, I was fitting into my pre-pregnancy jeans, wearing sizes I hadn’t seen in 2-3 years and feeling more confident. So maybe it wasn’t about the number after all? I realized that I just may never weigh 110 pounds again, and that’s okay. I fit into a lot of the same clothes I did when I was that weight (2 babies later and my body shape has changed a bit and there’s not much I can or would do change that! ), and I’m actually stronger and healthier than I was at that weight. I also set some workout-related goals for myself. Since I ride my bike so much, it was things like “Be able to do intervals out of the saddle at a cadence of 80 and resistance of 50” or just to add a 5 minute stretch to the end of every single workout. And I’d plan my workouts to meet those goals – and what do you know, I saw results! Finding a time that worked for me to workout consistently wasn’t the easiest, but once I found one (and got used to it), I was really motivated to keep it up! For me, that time has been 5:00 AM during the week and 6:00 AM on weekends, with the exception of Fridays when I will usually plan to do back-to-back live rides mid-morning. I’d hardly call myself a morning workout person but I found that making that time first thing in the morning sets the tone for me for the rest of the day. I read a quote somewhere the other day where someone was saying that the first hour of your day determines the course of the remainder of your day and I’ve found that to be really true for me. When I wake up to workout first, I don’t check my phone or my blog or E-mails or anything till it’s done. If I don’t, I sit in bed, get lost on Facebook and Instagram and almost worrying about the day ahead. If I do all of that scrolling after my workout (which I inevitably do because it’s my job and also, we all do it), I find that I approach it more positively. Maybe it’s a little trick my mind is playing on me, but it works. 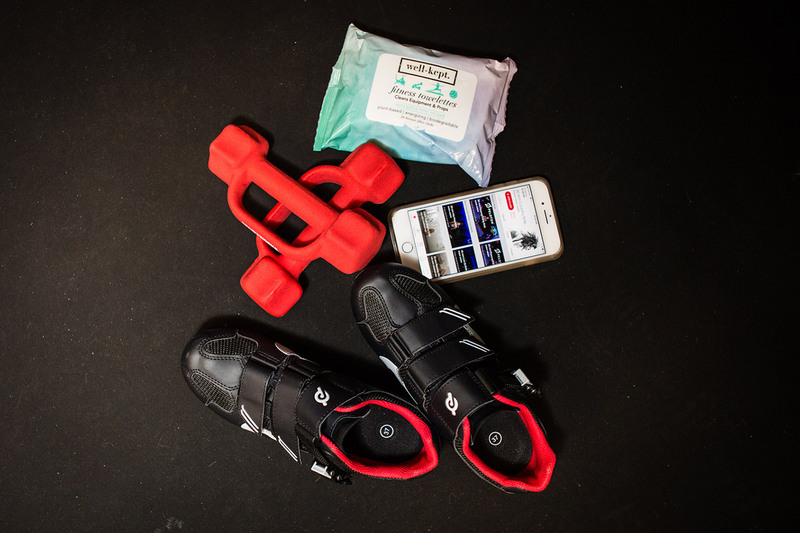 **Side note: if you’re interested in knowing if/why I like our Peloton (spoiler: I LOVE IT), check out this blog post. You motivate me! Thanks for all your great Instagram stories featuring your Peloton workouts!